The 1945 World Series matched the American League Champion Detroit Tigers against the National League Champion Chicago Cubs. The Tigers won the Series four games to three, giving them their second championship and first since 1935. The Curse of the Billy Goat originated in this Series before the start of Game 4. Having last won the Series in 1908, the Cubs owned the dubious record of both the longest league pennant drought and the longest World Series drought in history, not winning another World Series until 2016. The visiting Cubs began with a bang, scoring four times in the first. With two outs and runners on first and third, a passed ball by future Hall of Famer Hal Newhouser scored the game's first run. After an intentional walk, a two-run Bill Nicholson double and Mickey Livingston's RBI single made it 4–0 Cubs. In the third, after a leadoff double, Phil Cavarretta's single and Andy Pafko's double scored a run each. One out later, Livingston's second RBI single of the game knocked Newhouse out of the game. Cavarretta's two-out home run in the seventh off Jim Tobin made it 8–0. Pafko then singled, stole second, moved to third on a passed ball, and scored the game's last run on Nicholson's single. Hank Borowy pitched a complete game shutout despite allowing 12 base runners as the Cubs took a 1–0 series lead. The Cubs scored two runs in the fourth off Stubby Overmire on RBI singles by Bill Nicholson and Roy Hughes after a leadoff double and one-out walk. They added another run in the seventh off Al Benton when Mickey Livingston hit a leadoff double, moved to third on a groundout and scored on Claude Passeau's sacrifice fly. They now led the series 2–1. Back in form, Hal Newhouser went the distance for Detroit, striking out nine. The Tigers struck first in the top of the third on Doc Cramer's sacrifice fly with runners on first and third, but the Cubs tied the game in the bottom half when Hank Borowy doubled with two outs and scored on Stan Hack's single. 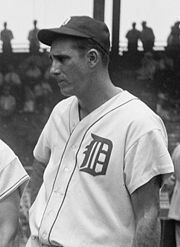 In the sixth, Cramer hit a leadoff single and scored on Hank Greenberg's double. After a single, Rudy York's RBI single knocked starter Hank Borowy out of the game. Hy Vandenberg in relief intentionally walked Paul Richards with one out to load the bases before a walk to Newhouser and Skeeter Webb's groundout scored a run each. Next inning, Jimmy Outlaw's sacrifice fly with runners on first and third off Paul Derringer made it 6–1 Tigers. In the bottom of the inning, with runners on first and third with two outs, Bill Nicholson's fielder's choice and Mickey Livingston's ground-rule double scored a run each. In the ninth, after a hit-by-pitch and double, Roy Cullenbine's two-run double off Paul Erickson made it 8–3 Tigers. In the bottom half, Phil Cavarretta hit a leadoff double and scored on Nicholson's one out single before Newhouser retired the next two batters to end the game and put the Tigers one win away from the championship. In Game 6, the Tigers struck first on a bases-loaded walk to Paul Richards by Claude Passeau in the second. In the fifth with the bases loaded off Virgil Trucks, Stan Hack's two-run single put the Cubs up 2–1. After another walk loaded the bases, Phil Cavarretta's two-run single knocked Trucks out of the game. Back-to-back leadoff doubles next inning by Mickey Livingston and Roy Hughes off Tommy Bridges made it 5–1 Cubs. In the top of the seventh with two on and two outs, RBI singles by Roy Cullenbine off Passeau and Rudy York off Hank Wyse cut the Cubs' lead to 5–3, but they got those runs back in the bottom half on a bases loaded walk to Livingston by Bridges followed by Roy Hughes's RBI single off Al Benton. In the top of the eighth, after a leadoff walk and double, an error on Joe Hoover's ground ball scored a run, then Eddie Mayo's RBI single scored another with Hoover going to third and Mayo being tagged out at second. Ray Prim relieved Wyse and allowed a sacrifice fly to Doc Cramer before Hank Greenburg's home run tied the game. In the 12th, after a one-out single by Frank Secory off Dizzy Trout, pinch-runner Bill Schuster came all the way around on Stan Hack's walk-off double to left, forcing a Game 7. The Cubs went with the overworked Borowy, who lasted just three batters, each of whom singled, the last of which scoring a run. Paul Derringer replaced him, intentionally walked Roy Cullenbine with one out to load the bases, then one out later, walked Jimmy Outlaw before Paul Richards clear the bases with a three-run double. The Cubs got a run in the bottom of the first on Phil Cavarretta's RBI single with two on off Hal Newhouser, but in the second, Derringer allowed a two-out single, then three consecutive walks to force in another run. The Cubs got another run run in the fourth when Cavaretta singled and scored on Andy Pafko's triple. In the seventh, Cullenbine drew a leadoff walk off Paul Erickson and scored on Paul Richards's two-out double. Next inning, Skeeter Webb drew a leadoff walk off Claude Passeau and scored on Eddie Mayo's double. After moving to third on a groundout, he scored on Hank Greenberg's sacrifice fly. The Cubs scored just one more run in the bottom of the inning on Bill Richardson's RBI double with two on as Newhouser pitched a complete game to give the Tigers the championship. The Tigers would not make another World Series appearance until 1968, while the Cubs would not do so until 2016. ^ Ferraro, Michael X.; Veneziano, John (2007). Numbelivable!. Chicago, Illinois: Triumph Books. p. 119. ISBN 978-1-57243-990-0. ^ "1945 World Series Game 1 – Chicago Cubs vs. Detroit Tigers". Retrosheet. Retrieved September 13, 2009. ^ "1945 World Series Game 2 – Chicago Cubs vs. Detroit Tigers". Retrosheet. Retrieved September 13, 2009. ^ "1945 World Series Game 3 – Chicago Cubs vs. Detroit Tigers". Retrosheet. Retrieved September 13, 2009. ^ "1945 World Series Game 4 – Detroit Tigers vs. Chicago Cubs". Retrosheet. Retrieved September 13, 2009. ^ "1945 World Series Game 5 – Detroit Tigers vs. Chicago Cubs". Retrosheet. Retrieved September 13, 2009. ^ "1945 World Series Game 6 – Detroit Tigers vs. Chicago Cubs". Retrosheet. Retrieved September 13, 2009. ^ "1945 World Series Game 7 – Detroit Tigers vs. Chicago Cubs". Retrosheet. Retrieved September 13, 2009. Cohen, Richard M.; Neft, David S. (1990). The World Series: Complete Play-By-Play of Every Game, 1903–1989. New York: St. Martin's Press. pp. 201–206. ISBN 0-312-03960-3. Reichler, Joseph (1982). The Baseball Encyclopedia (5th ed.). Macmillan Publishing. p. 2153. ISBN 0-02-579010-2. History of the World Series - 1945 at The SportingNews. Archived from the original on 2008.